The case threatened to overshadow Facebook's latest results, which showed it enjoyed a strong end to the year. Facebook's net profit more than doubled to $3.6bn in the fourth quarter. The social network was helped by 53% growth in advertising revenues, and said it was on course to hit two billion users in the first half of 2017. The firm did not comment on the $500m damages. Zenimax chief executive Robert Altman said: "We are pleased that the jury in our case in the US District Court in Dallas has awarded Zenimax $500m for defendants' unlawful infringement of our copyrights and trademarks." The co-founder of Oculus, Palmer Luckey, was found to have broken a non-disclosure agreement with the firm. First, it was revealed he was using some of that money to fund a pro-Donald Trump trolling campaign, which led to Facebook removing him from public view. He didn't even turn up to his own company's developer's conference last year. And now, a jury has ruled that he broke a non-disclosure agreement that'll mean $500m in damages (unless Facebook wins on appeal). Mark Zuckerberg doesn't display many emotions - but you wonder what he'll be like behind closed doors on this one. As it stands, Palmer Luckey is still a Facebook employee, but what he's doing there is anyone's guess - the company won't even tell me his job title. 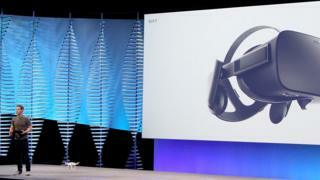 Facebook chief executive Mark Zuckerberg testified last month that "the idea that Oculus products are based on someone else's technology is just wrong". Zenimax, which owns id Software, a video games developer, was suing Facebook for $2bn. Along with the claims against Palmer Luckey, it alleged that John Carmack, co-founder of id, took intellectual property belonging to Zenimax when he left the firm to join Oculus as its full-time chief technology officer. Virtual reality is only a small part of Facebook's current business, but is seen as important to the firm's strategy over the next 10 years. Most of Facebook's fourth-quarter revenue - which jumped 54% to $27.6bn - came from adverts on its social network. "Facebook had another stellar quarter, delivering record revenue, user growth and profitability, as it rides the shift of advertising to online," said Martin Garner, a senior analyst at CCS Insight. "However it expects advertising growth to slow in 2017, so it expects to be less profitable this year." Other challenges that Facebook face this year include a changing approach to privacy in Europe, an uncertain business landscape in the US and challenges in China, Mr Garner said. The social network has also been widely criticised after some users complained that fake news on its platform had influenced the US presidential election. In a call with analysts on Wednesday, Facebook executives signalled it would tackle the problem through the use of more artificial intelligence. They also said many of Facebook's new users were in India, where telecoms operators had offered free data packages for Facebook traffic. For the full year, Facebook grew its net profit by 177% to $10.2bn.